20 years after the Earth Summit, life has become more difficult for the majority of the planet’s inhabitants. The number of hungry people has increased to almost one billion, which means that one out of six human beings is going hungry, women and small farmers being the most affected. Meanwhile, the environment is depleting fast, biodiversity is being destroyed, water resources are getting scarce and contaminated and the climate is in crisis. This is jeopardizing our very future on Earth while poverty and inequalities are increasing. The food system is increasingly in the grips of large corporations seeking profit, not aimed at feeding the people. The Convention on Biodiversiy has created benefit sharing mechanisms but at the end of the day, they legitimize the capitalization of genetic resources by the private sector. The UN Convention on Climate Change, instead of forcing countries and corporations to reduce pollution, invented a new profitable and speculative commodity with the carbon trading mechanisms, allowing the polluter to continue polluting and profit from it. The “Green Economy” – Final Enclosure? Today the “greening of the economy” pushed forward in the run-up to Rio+20 is based on the same logic and mechanisms that are destroying the planet and keeping people hungry. For instance, it seeks to incorporate aspects of the failed “green revolution” in a broader manner in order to ensure the needs of the industrial sectors of production, such as promoting the uniformity of seeds, patented seeds by corporation, genetically modified seeds, etc. The capitalist economy, based on the over-exploitation of natural resources and human beings, will never become “green.” It is based on limitless growth in a planet that has reached its limits and on the commoditization of the remaining natural resources that have until now remained un-priced or in control of the public sector. In this period of financial crisis, global capitalism seeks new forms of accumulation. It is during these periods of crisis in which capitalism can most accumulate. Today, it is the territories and the commons which are the main target of capital. As such, the green economy is nothing more than a green mask for capitalism. It is also a new mechanism to appropriate our forests, rivers, land… of our territories! 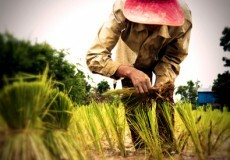 Since last year’s preparatory meetings towards Rio+20, agriculture has been cited as one of the causes of climate change. Yet no distinction is made in the official negotiations between industrial and peasant agriculture, and no explicit difference between their effects on poverty, climate and other social issues we face. The “green economy” is marketed as a way to implement sustainable development for those countries which continue to experience high and disproportionate levels of poverty, hunger and misery. In reality, what is proposed is another phase of what we identify as “green structural adjustment programs” which seek to align and re-order the national markets and regulations to submit to the fast incoming “green capitalism”. Investment capital now seeks new markets through the “green economy”; securing the natural resources of the world as primary inputs and commodities for industrial production, as carbon sinks or even for speculation. This is being demonstrated by increasing land grabs globally, for crop production for both export and agrofuels. New proposals such as “climate smart” agriculture, which calls for the “sustainable intensification” of agriculture, also embody the goal of corporations and agri-business to over exploit the earth while labeling it “green”, and making peasants dependent on high-cost seeds and inputs. New generations of polluting permits are issued for the industrial sector, especially those found in developed countries, such as what is expected from programs such as Reducing Emissions from Deforestation and Forest Degradation (REDD++) and other environmental services schemes. The green economy seeks to ensure that the ecological and biological systems of our planet remain at the service of capitalism, by the intense use of various forms of biotechnologies, synthetic technologies and geo-engineering. GMO’s and biotechnology are key parts of the industrial agriculture promoted within the framework of “green economy”. The promotion of the green economy includes calls for the full implementation of the WTO Doha Round, the elimination of all trade barriers to incoming “green solutions,” the financing and support of financial institutions such as the World Bank and projects such as US-AID programs, and the continued legitimization of the international institutions that serve to perpetuate and promote global capitalism. Small-scale farmers, family farmers, landless people, indigenous people, migrants – women and men – are now determined to mobilize to oppose any commodification of life and to propose another way to organize our relationship with nature on earth based on agrarian reform, food sovereignty and peasant based agroecology. We reject the “Green Economy” as it is pushed now in the Rio+20 process. It is a new mask to hide an ever-present, growing greed of corporations and food imperialism in the world. We oppose carbon trading and all market solutions to the environmental crisis including the proposed liberalization of environmental services under the WTO. We reject REDD (Reducing Emissions from Deforestation and Forest Degradation) which allows rich countries to avoid cutting their carbon emissions by financing often damaging projects in developing countries. We expose and reject the corporate capture of the rio+20 process and all multilateral processes within the United Nations. We oppose land grabs, water grabs, seeds grabs, forest grabs – all resources’ grabs! We demand a complete ban on geoengineering projects and experiments; under the guise of ‘green’ or ‘clean’ technology to the benefit of agribusiness. This includes new technologies being proposed for adaptation and mitigation to climate change under the banners of “geo-engineering” and “climate smart agriculture”, including false solutions like transgenic plants supposed to adapt to climate change, and “biochar” purported to replenish the soil with carbon. We resolve to protect our native seeds and our right to exchange seeds. We demand genuine agrarian reform that distributes and redistributes the land – the main factor in production – especially taking into account women and youth. Land must be a means of production to secure the livelihood of the people and must not be a commodity subject to speculation on international markets. We reject “market assisted land reform”, which is another word for land privatization. We struggle for small scale sustainable food production for community and local consumption as opposed to agribusiness, monoculture plantations for export. We continue to organize and practice agroecology based production, ensuring food sovereignty for all and implementing collective management of our resources. We will be in Rio at the People’s Summit where anti-capitalist struggles of the world will meet and together we will propose real solutions. The People’s Permanent Assembly, between the 18 and 22, will present the daily struggles against the promoters of capitalism y the attacks against our lands. Today, Rio de Janeiro is one of the cities which receive the most contributions from global capital and will host the Soccer World Cup and Olympics. We will unite our symbolic struggles from the urban to the landless movements and fishers. Dream of a different world and create it!! The future that we want is based on Agrarian Reform, Peasant’s based sustainable agriculture and Food Sovereignty!